Are you sensitive to the change in seasons and don’t react too well to a distinct change in the amount of natural light available? Winter blues, or SAD, is very common and is triggered by the shortness or lack of daylight hours. When the skies are grey and you’re feeling blue, you can bring the light inside by using the Innolux Lucia light therapy lamp to lift your mood. Introducing the Innolux Lucia; a handy-sized bright light device designed with you in mind. This delightful little SAD lamp incorporates versatility, durability and longevity into its modern and attractive design. The useful luminaire can be used in larger as well as the more confined spaces, because it can be mounted on the wall for your convenience. The high-quality technical components of the lamp also make it a durable and long lasting product. What’s more is that you can enjoy using your Innolux Lucia without maintenance for more than 10 years! The lamp frame itself is constructed from powder-coated metal. The luminaire comes equipped with a dimmer, which enables you to adjust the lighting as needed to suite your preferences. It is also highly suitable as general lighting for a table in any room you choose. Eliminate these inhibiting feelings and begin by enjoying a bright light therapy session 3-5 times a week throughout the winter. If you find your symptoms are not relieved or they reappear, then try taking daily sessions for 1-2 weeks. You may even want to begin with daily sessions or repeat this intensity whenever you feel you need to. 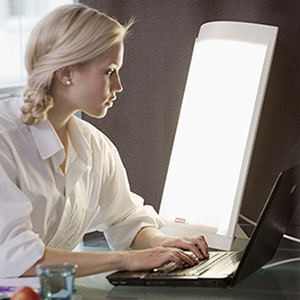 Bright light therapy also helps to speed up your recovery from jet lag! A session in the evening will delay your sleep cycles, while a session in the morning will have the opposite effect. When you begin light therapy using your Innolux Lucia, it is useful to take notes on the effects it has on you. This will help you to determine which way the therapy works best for you. Light therapy for SAD, Winter Blues & depression.